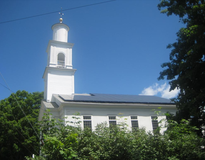 According to the MASS CEC, this is one of the most efficient PV systems in the area, producing in the top 1% of comparable systems. It has produced 46,250 kWh in 2012! 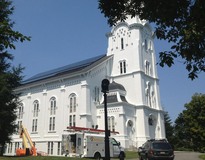 This 34.04 kW photovoltaic system consists of 148 Sunpower 230 watt photovoltaic modules mounted in 2 separate arrays, one on the southwest and one on the southeast roof of the church, and 4 SUNNYBOY 8000 inverters mounted by the electrical panel. The system has generated 46,250 kWh in 2012! 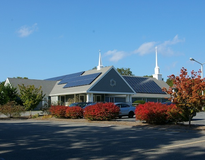 In addition to the financial and environmental benefits, setting an example of good stewardship for other congregations and members of the community is our mission. Our system produces over 100% of our consumption and we have enjoyed substantial income to offset the original cost of the system since 2011! We wanted to benefit the environment and set an example of good stewardship for the community. 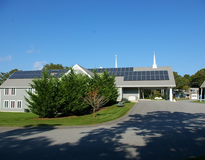 Net zero our electric bill and find a wise investment for the future of our congregation. For a congregation, generally, it is much less complicated to finance a system through an endowment, grant or mortgage. The experience was extremely positive. CED was very helpful in assisting us in exploring a number of financing options and educating our congregation about the system production, SREC"s, maintenance and warranties. The crew was professional and installed a robust, highly productive system. Tour hours from 9-1 on Saturday October 5th.